At the time of his retirement in 1973, Johnny Unitas, the superstar quarterback of the Baltimore Colts, held virtually every career passing record that existed in the National Football League. Since that time, some of those records have been surpassed. One record, however, still remains and may be one of the NFL's few unbreakable records. C omparable to Joe Dimaggio's 56-game hit streak, Unitas compiled a string of 47 straight games in which he threw at least one touchdown pass. This record, which has stood for almost 40 years, has only been challenged once when Miami Dolphins quarterback Dan Marino compiled a 30-game streak in the 1980s. Unitas' remarkable feat began during his rookie campaign in a game against the Los Angeles Rams in 1956. Four years later and 11 games into the 1960 season, the streak finally ended against the same Rams team that the streak had begun. By completing 697 passes for 10,645 yards and 102 touchdowns during the 47-game string, Unitas quickly became recognized as one of the greatest quarterbacks to play the game. Seven different Colts were on the receiving end of his scoring passes, but Hall of Famers Raymond Berry with 38 TD catches, and Lenny Moore with 27, were Unitas' favorite targets. 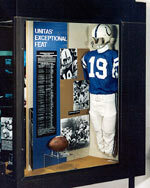 After a record-filled 18-year career, and three championships, Unitas himself was inducted into the Hall of Fame in 1979. His full uniform is on display at the Hall as well as the football he threw to surpass 40,000 passing yards.